Batwing races Menace to attempt to save his family! But the Gotham Underground is about to boil over with anarchy, and no matter which tribe rises up from below Gotham City, Batwing will be the first target! Art- It’s been well established already that Eduardo Pansica’s art is consistent, sharp, clean yet detailed and well suited to the high octane action. Story– Luke escapes from the subterranean fish monster. He rescues a man from the “speaker heads”. After bartering his way into a disguise he is lead into an ambush under the pretense that he’s getting info on his sister’s location. He manages to capture the leader of the Anubis gang “Mother of Anubis”. Before he can escape he runs straight into Menace. Back in Gotham Lucius is losing his mind with Luke and Tiff missing and Tamara now comatose. Batman however can’t find Luke because of the cloaking technology present in the subterranean underworld. Action– Batwing vs. subterranean fish monster? Check! Batwing vs. the Anubis gang? Check! There was also a brief skirmish between some prisoners and the Speaker heads. 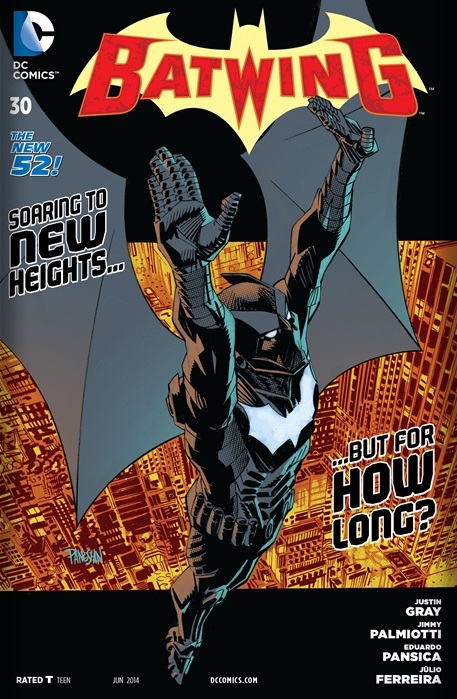 As usual Batwing manages to have a great balance of story and action. Eduardo Pansica’s art continues to do an excellent job of rendering the action. Culture– I’m still fascinated by everything about this underground world has going on. None of it is terribly original but the way everything fits together is interesting; Slavery, rival gangs, microcosms etc. Black Hero– Luke Fox is still alive and literally kicking this issue (thankfully). The battle raging inside Luke continues though, the anger over what happened to his sister is very close to the surface yet he does need his brain and wits to stay alive in this city. Lucius is the panicking father and given his current situation is entirely understandable. Tiff, baby of the Fox clan is a fiery as always but understandably freaking out about the situation in which she currently finds herself. Villains– Menace finally comes face to face with Batwing and I would kill to learn more about Mother of Anubis. Cover- While it’s not a bad illustration the departure from the typical stylized covers we’ve seen thus far is a bit jarring. Overall this was an enjoyable read with good art, characterization and action though it lacked the emotional resonance of the last few issue. We give this one 3/5 stars!